College education, informally referred to as College and often incorrectly by the umbrella acronym CEGEP in the Canadian province of Quebec is the post-secondary level immediately after high-school but required for university admissions. The Quebec education system is unique in North America. 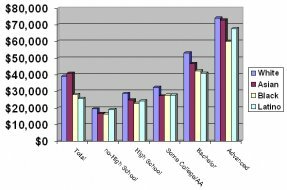 One aspect of that uniqueness is that it is the only system that has four separate education levels: grade school, high school, college, university. The college level is a separate and distinct step in Quebec. For students graduating from high school in Quebec a college diploma is required for admission into university. In the rest of Canada colleges have historically been technical schools that offer specialized professional or vocational education in specific employment fields. In the USA the term college is synonymous with university. Pre-University programs of two years, leading to a college diploma required for university admissions. Specialized vocational programs of either three years, leading to a college diploma and entry to the job market, with a possibility of university admissions, or one year leading to a college certificate and direct entry into the workforce. There are three types of colleges in Quebec, public colleges, private colleges, and government colleges. The majority of college students attend a public General and Vocational College, also known as the French acronym "cegep" (French: Collège d'Enseignement General et Professionel). These colleges do not charge tuition to Quebec residents, although small administrative fees are charged. A large number of private colleges also exist at the collegiate level. Some of these schools receive funding from the government, others do not, and therefore tuition can vary greatly between schools. There are a small number of collegiate level government institutions that are not private colleges, yet also not public colleges, as defined under Quebec's General and Vocational College law. One example is the Quebec Music Conservatory.